Find artworks, auction results, sale prices and pictures of Nogami Ryuki at auctions worldwide. 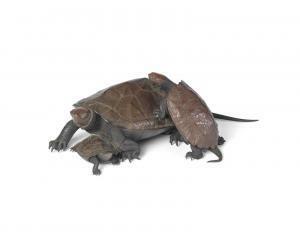 A Bronze okimono group of three turtles By Nogami Ryuki (1865-1932), Meiji (1868-1912) or Taisho (1912-1926) era, late 19th/early 20th century Naturalistically cast, showing one small turtle attempting to climb on the back of the largest turtle, the smallest crawling between the legs of the adult, the details finely wrought, signed on the base of the largest turtle Nogami Ryuki within a square seal; with wood storage box stuck with a paper label with an inscription indicating this bronze turtle group was among the possessions of the Empress Shoken (1849-1914), a consort of Emperor Meiji. 9cm x 22.5cm (3½in x 8¾in). (2).